Hi friends! I hope you are enjoying your summer as much as we are! Our granddaughters have been visiting and our days have been busy, but I thought I’d stop long enough to show you this summer’s version of the topsy turvy planter. 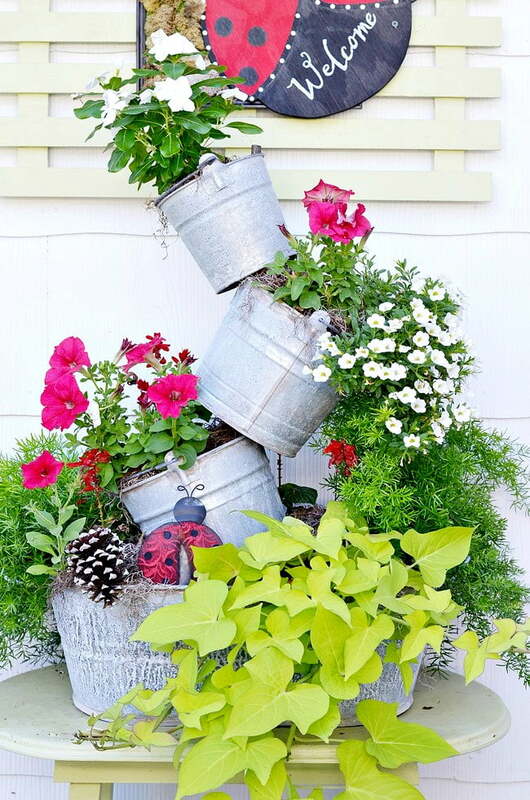 It’s been over 3 years since we first created this planter, and a full tutorial on how to make one can be found in this post: TOPSY TURVY GALVANIZED BUCKETS. I’ve continued to plant it up season after season and always get many compliments on it. Ever since I found the small oval topped table that you see in the above photo, I have kept the planter on our back deck. The oval topped table mimics the bottom oval galvanized bucket. So the topsy turvy planter is the first thing anyone sees when they walk up to the back door. All of our friends are “back door” friends which, in my opinion, are the best kind! This year’s version of the topsy turvy planter was inspired by this adorable wooden ladybug sign that my hairdresser gave me. You see, her daughter makes these and I had complimented my hairdresser on hers and she just happened to have another one in the shop that she handed to me. 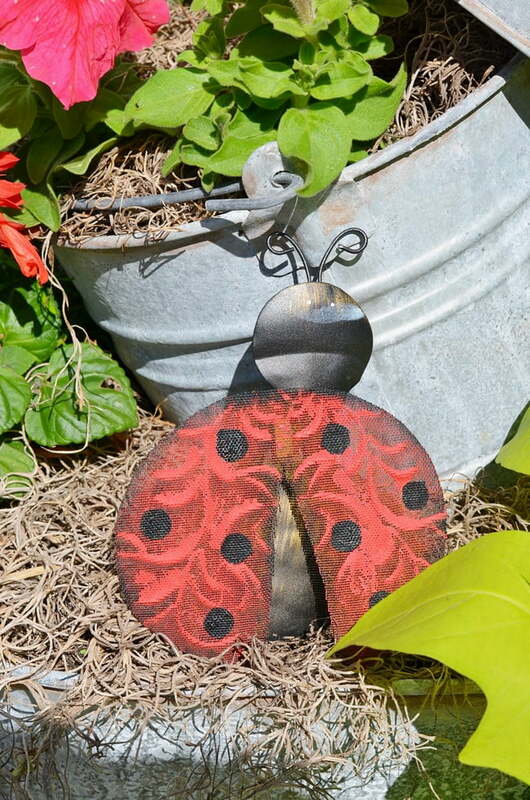 Both of us love to garden and know the benefits of those ladybugs. But besides that, aren’t they just the cutest things? 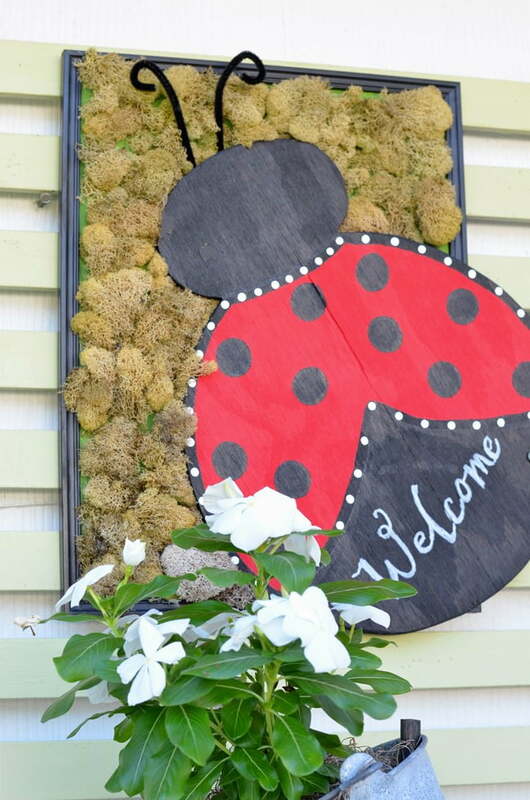 I thought the ladybug needed something green to “land on” so I hot glued some moss to an old plastic frame. I don’t have to worry about it getting wet because it’s underneath the eave of the house. So the ladybug sign drove the decision of the choice of plants for the planter. 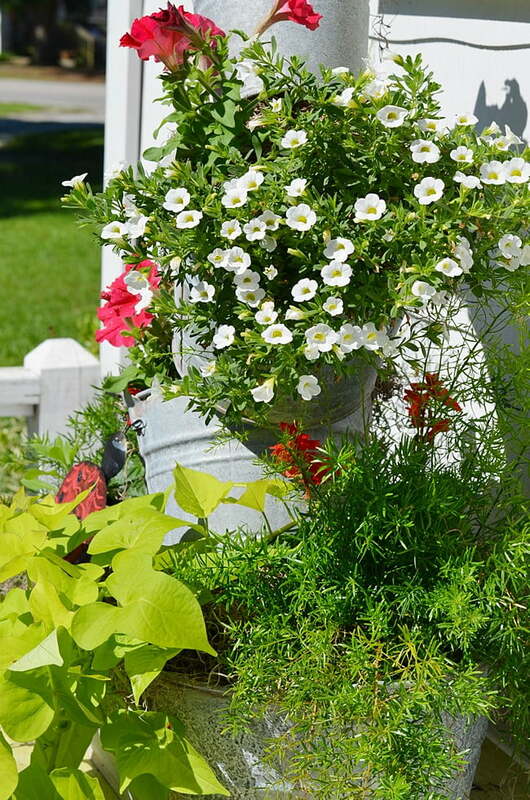 In the top bucket, I put white vinca that does well in our heat and humidity here in South Carolina. Several of the buckets were potted up with old fashioned red petunias and a few red salvia plants. 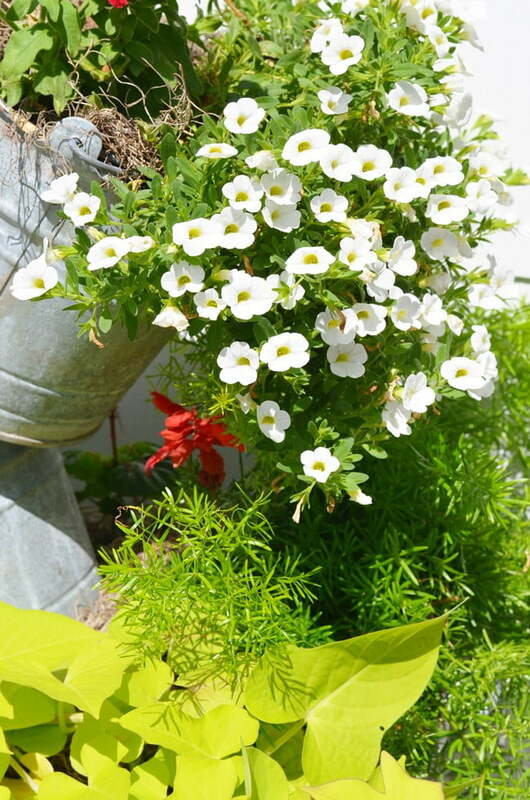 One of the buckets contains white calibrachoa, also known as “million bells.” It’s also a great performer in our heat, and I just love how it’s spilling out of one of the containers. The asparagus ferns were planted in the topsy turvy planter last fall and came back this spring. They make great space fillers! And the sweet potato vine was tucked in about a month ago and is now almost touching the deck! 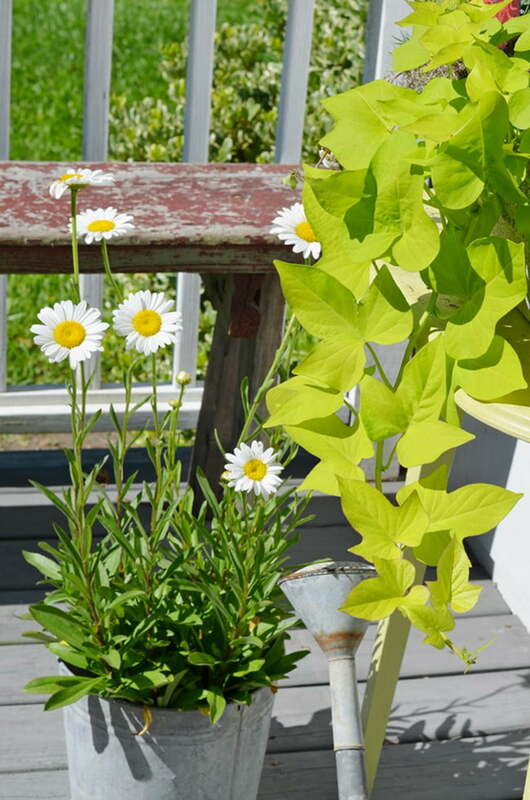 My hairdresser, Tip Bell, also gave me this Shasta daisy that you see on the deck. It’s already been planted in the flower garden along with another one. Love me some daisies! Another sweet ladybug tucked in among the plants carries out the summer theme. Did you notice that I put Spanish moss around the plants in the planter? 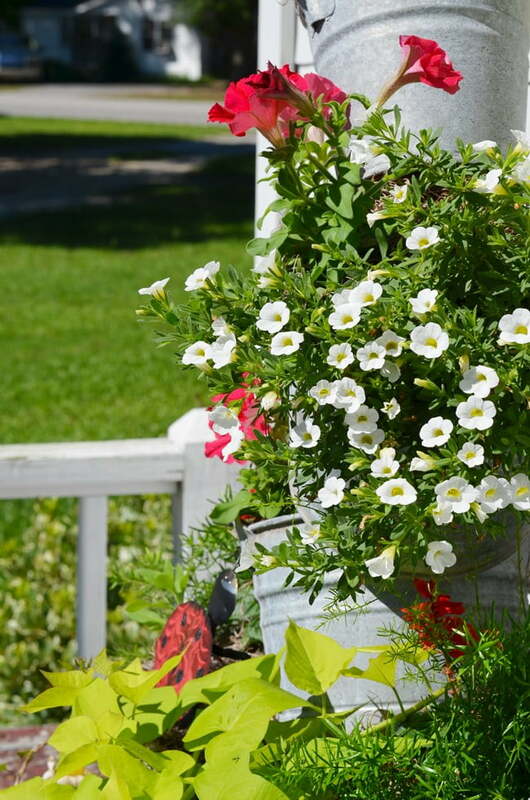 Not only does it tidy up things, but it helps the plants retain moisture. 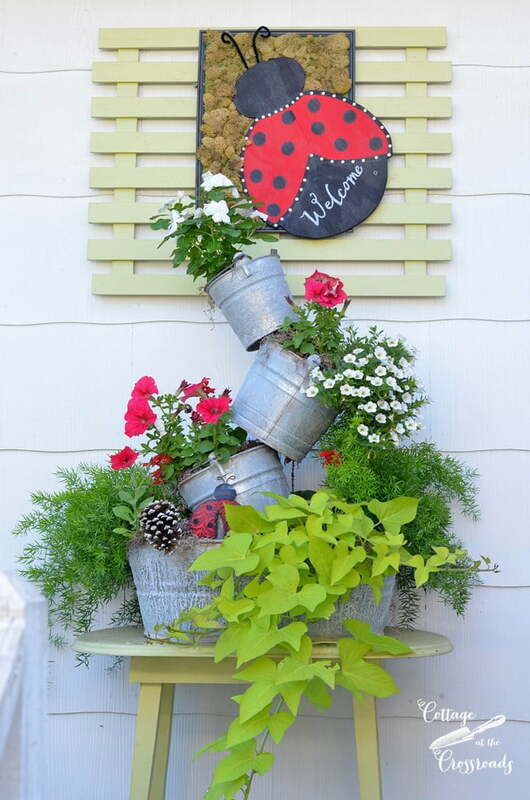 This summer version of the topsy turvy planter may be my favorite version yet! Is it yours? I’ll be back soon to share some projects that the granddaughters have been helping me with recently. In the meantime, enjoy every moment of your summertime! 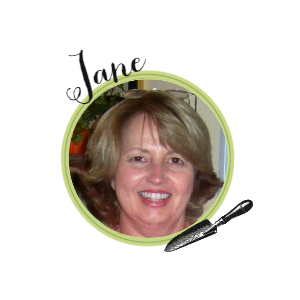 Hi Jane, I just saw your original and loved it and so I headed over to see your page. Love this version as well…adorable! 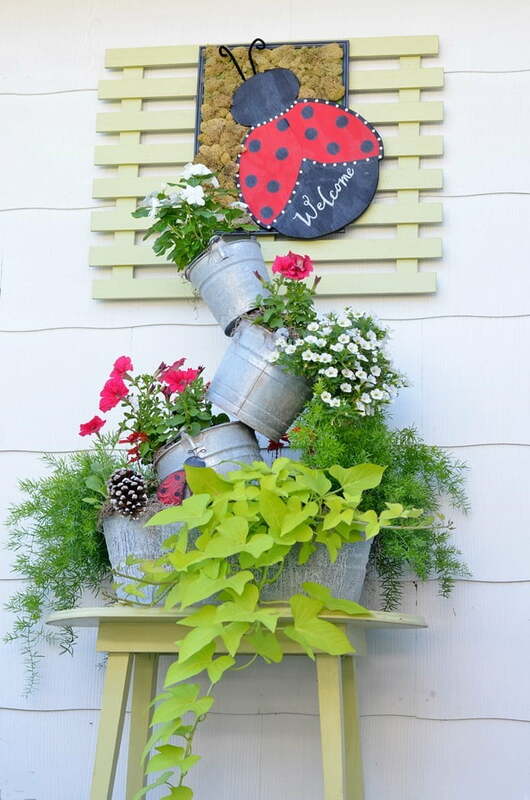 That planter is so pretty and the lady bug adorable. I bet your yard and home is full of wonderful creations. 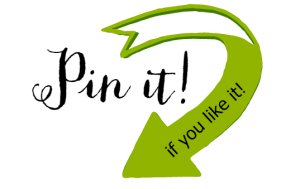 Love your blog here. 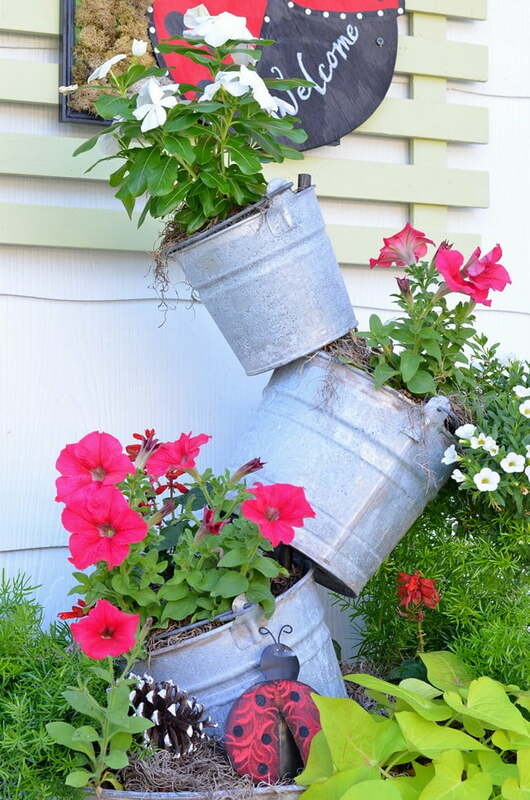 Yes Jane I think this addition of the Topsy Turvey planter is my favorite. I am a big fan of lady bug decor. Love it. 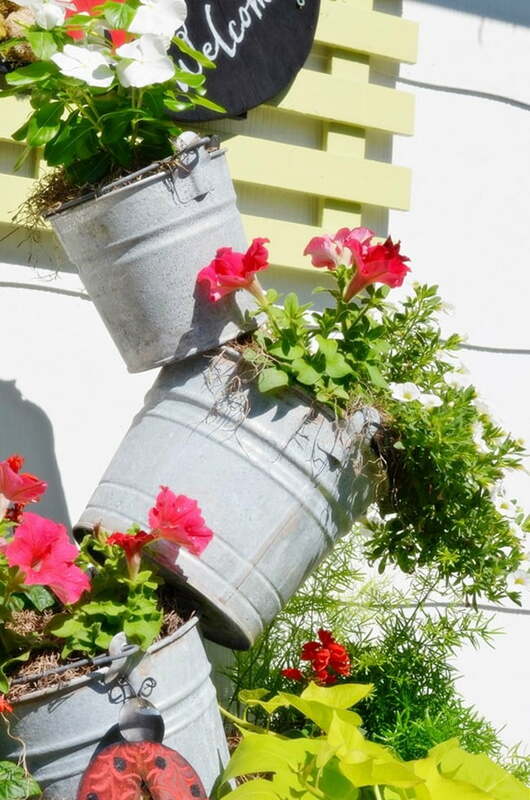 I look forward to seeing what you create and place in this wonderful Topsy Turvy Planter! Love this! 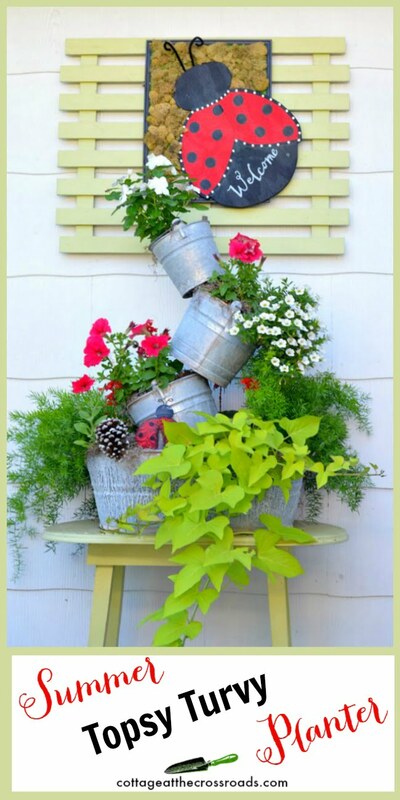 You are the queen of the topsy turvy planters Jane, and this one is adorable! 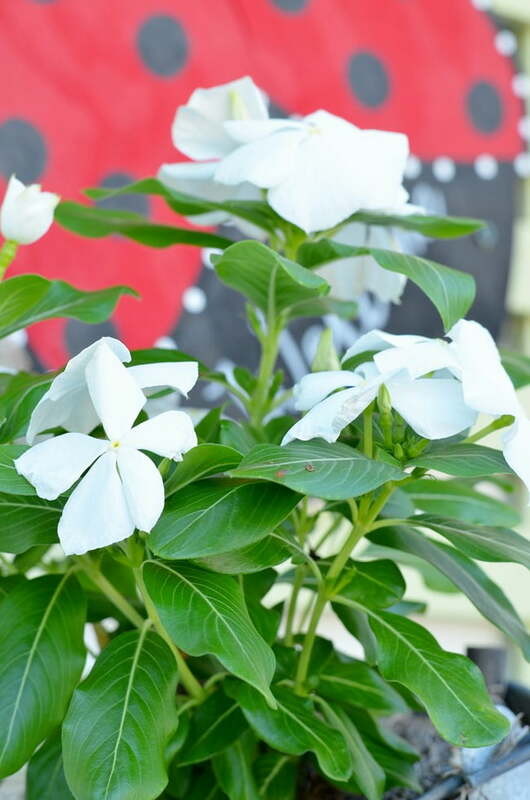 Jane I love the plants you planted in your pots. I stuck with the petunias that spill over but I have all the other plants in my garden. Maybe next year.